Williams F1 – one of the most iconic racing teams ever to compete in motor racing’s top-flight series. 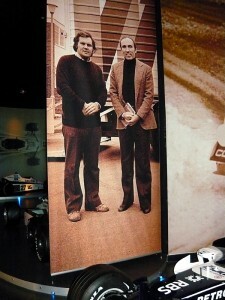 Formed in 1977 by Frank Williams and Patrick Head, it is one of only three teams in Formula One to have won 100 races. It has also taken nine constructor’s titles between 1980 and 1997 and seven drivers’ championships. When it comes to association with motorsport’s great names, Williams is racing aristocracy in a way that can only be matched by Ferrari, Benetton/Renault or McLaren. Drivers associated with the team include Nigel Mansell, Damon Hill, Keke Rosberg, Alan Jones, Ayrton Senna, Nelson Piquet, Alain Prost, David Coulthard and Jacques Villeneuve. Top designer Adrian Newey also helped steer the team to many of its victories. While its three sparring partners are all either manufacturer-backed or manufacturer-run, Williams has continued as the only serious player to remain independently-owned. Many racing fans see it as the ultimate privateer team. This has caused it problems in the current financial climate, especially since it parted company with its engine supplier BMW in 2006. But Williams is more than anything an expression of the sheer force of personality of its 67-year-old founder, Sir Frank Williams, and the determination with which he pushes it forward towards its single goal of going racing, in the face of whatever obstacles life and business throw at him. The Grove factory is, more than anything, a testament to “Frank” as he seems to be universally known among the workforce, who has a flat on the premises and who is ‘at the office’ seven days a week. We were invited to visit Williams HQ in Grove, Oxfordshire as part of a tour for bloggers and web journalists organised by the team’s sponsor Philips in order to promote a competition it was running. The tour and subsequent visit to the team’s private museum gave us a fantastic insight into its thinking, the way it runs and its overarching desire simply to go racing. We hope that the material below helps share this insight. The in-depth story of our trip, courtesy of Williams F1 sponsor Philips, to join other bloggers and web journalists for a tour of the team’s factory in Grove, Oxfordshire. The aim was to brief us on a competition to allow an ordinary fan to drive an F1 car but, while there, we also toured parts of the factory, interviewed technical director Sam Michael and visited the team museum. All in all we were there for half a day – here is what it’s like to be behind the scenes at an F1 factory. If you’ve watched F1 drivers on the telly and thought “I could do that”, here’s your chance to prove it in a competition that could put you behind the wheel of a Formula One car for five laps. This week saw the Williams F1 team open up its Grove, Oxfordshire, HQ to a party of bloggers and web journalists to publicise a competition it is running with its sponsors Philips. The result? An intriguing glimpse inside its Grove headquarters and F1 museum. Share it here. More than a dozen F1 fans, 15 minutes for questions – what did Sam Michael face? And what secrets did he impart as to the best way to impress him behind the wheel of a F1 car? (Hint: it’s not doing donuts or trying to lay down record lap times.) Listen to the full interview here (17 mins 17secs). Transcript to follow. You might argue that Jeff has one of the best jobs at Williams F1 – running the simulator that allows drivers to try out any circuit, master the complexities of the steering wheel and be evaluated by the team. But it’s a lot more than just a giant computer game. The first sound clip is recorded in the simulator itself where Jeff gives a detailed description of what a driver can do from the steering wheel and cockpit. The second is a sit-down Q&A. Listen here (4 mins 34 secs) and here (8 mins 11 secs). Transcript to follow. Brian explains the complexities of seat fitting – combining driver measurements and the two-dimensional seat design into a three-dimensional item ready to go in the racecar. He uses one of Nico Rosberg’s seats to demonstrate the issues involved. A fascinating glimpse into the nuts and bolts of race engineering. Listen here (8 mins 55 secs) Transcript to follow.